The Salubong is a Filipino tradition done early in the morning of Easter Sunday, wherein the images of the Risen Christ and Sorrowful Mother symbolically meet in a pre-dawn procession. 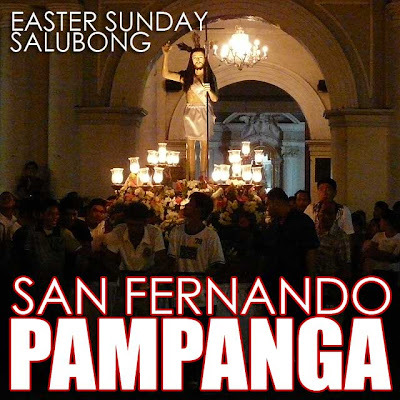 While many parishes have moved it to late Saturday night for convenience, the real traditional Salubong happens right before dawn. I was actually wondering if the pusu-puso was still being used in Pampanga. I should have asked. Anyway, I watched the Salubong in San Fernando late Saturday night which was quite simple. The Bacolor salubong or pusu-pusuan was also at midnight and they used the pusu-puso! The photo above is from Tom Joven. The next morning, I proceeded to Minalin and Santo Tomas to witness the Pakbung Hudas Easter Sunday festivities. 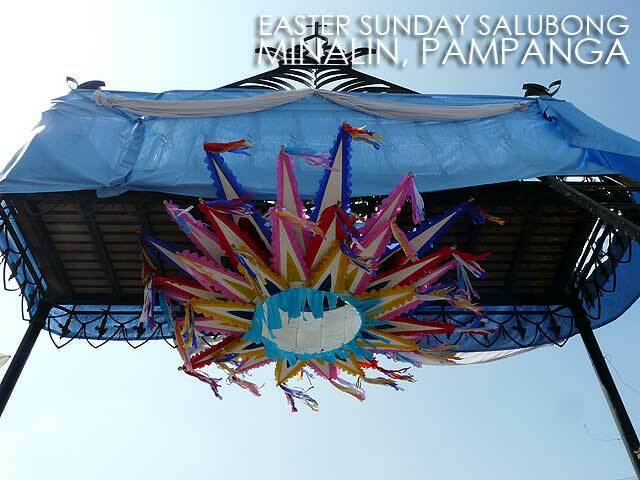 And lo and behold, the opened pusu-puso were hanging from the church gates! The Salubong in Minalin was at 4 a.m. while the one in Santo Tomas was at 5:30 a.m. 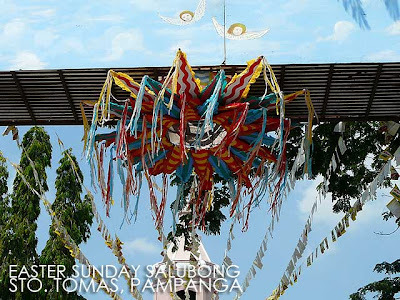 The puso-puso is a fine example of folk art used for the Salubong. It's basically shaped like a bud with several layers of petals made out of cardboard, papel de hapon and crepe paper. 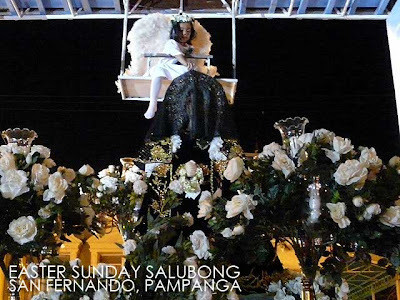 Hidden above the pusu-puso is a little girl dressed as an angel. The veiled image of the Sorrowful Mother is brought under the pusu-puso. 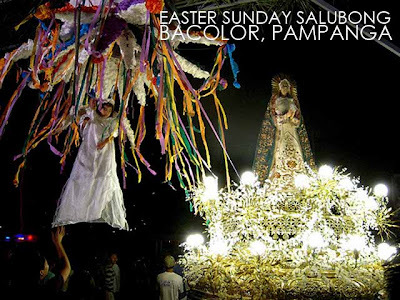 Layer by layer, the pusu-puso opens, raining petals and confetti on the images of the Mater Dolorosa and Risen Christ. With the opening of the last layer, doves fly out and the little girl, who sings Regina caeli, laetare, alleluia (Queen of Heaven, rejoice, alleluia), is lowered on a swing just right over the head of the Mater Dolorosa so she could take off the veil. Once the veil is removed, fireworks are lit, the marching band starts playing and the crowd applauds. The Easter Season has begun. how ignorant this people,,they worshiping an idol...huh...dont you know guys that it is an abonition to the eyes of the LORD,,?? ?